PCB Assembly tooling fees cover a broad range of services. A majority them fall under NRE charges, or non-recurring engineering charges. The chart below breaks down the different tools and programs covered under the tooling fees. Sierra Circuits waives the tooling fees on all orders. The chart below describes what the tooling costs covers. 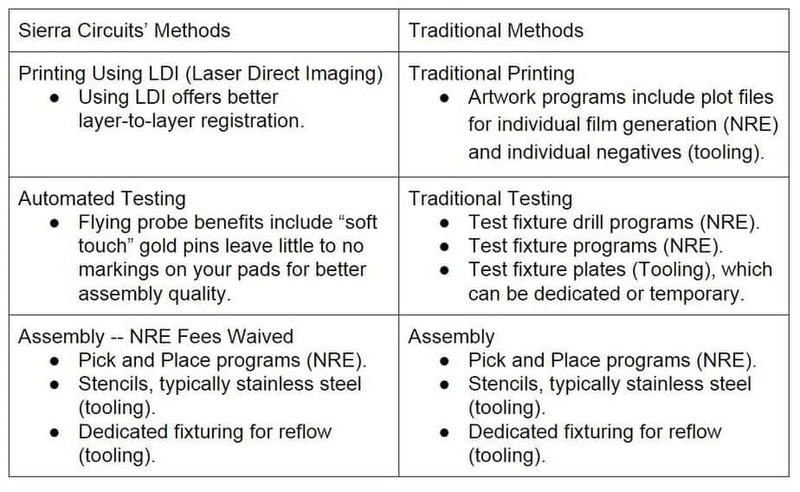 Check out the differences between traditional tooling procedures and the more modern procedures Sierra provides. Have questions on your next design? Leave them in the comments below. We’d love to hear from you.